Long before the television set took center stage in our living rooms, a cozy fire provided all the entertainment people needed. 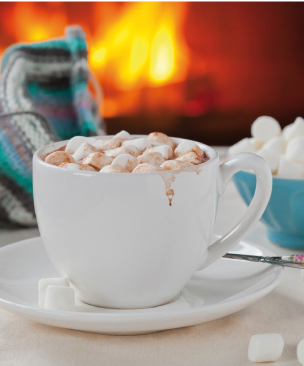 When you own a fireplace, you have a front-row seat to a show that gives repeat performances this time of year. As you draw back the curtain (maybe you have a metal mesh curtain like mine), you see flames dance and logs crackle on the stage, bringing warmth to your body and to your soul. Fire has a natural way of keeping our attention; it’s a little hypnotic. Experts say just watching a fire for a few minutes is a proven stress reliever. The sights, sounds and smells draw us in, releasing all the worries of the day. There are many fun, creative ways to enhance this spotlight performance for your family and guests throughout the holiday season. Deciding what to burn is perhaps the best start. Artificial logs continue to receive accolades from clean-air agencies. Made of recycled materials mostly from food production (like nutshells) that are bound by vegetable paraffin, these “green logs” are not only cleaner for the air, but also more efficient. One leading manufacturer attests to one of its logs burning as long, and much cleaner, than 30 pounds of firewood. You can even buy these manufactured logs with additives that create the cracklin’ sound of a real wood fire or buy color logs that burn with hues of green, blue and purple. If you enjoy chemistry, there are pre-packaged chemicals you can buy called “flame crystals” that create different hues in a traditional wood fire, too. 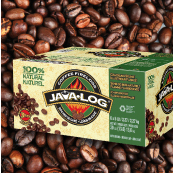 Java logs are receiving glowing reviews from homeowners and are one of the most popular options on the market today. Made from recycled coffee grounds, which have a higher heat density than wood, these logs burn hotter and for an average of three hours. There’s virtually no ash to clean up and there’s 50 percent less soot build-up in the chimney after burning them. They are great starter logs; just don’t expect a coffee aroma. Some people may detect a faint sweet smell, but most don’t notice any smell at all. But for the earth-conscious, knowing you’re helping to divert some of the millions of pounds of coffee waste from landfills is a great feeling. Another popular option is a newspaper log. Newspapers are great fire starters, and some people use mounds of them in place of wood in their fireplace. A simple web search reveals many “recipes” for these logs, and places where you can purchase a special log roller for the job. You start by soaking the newspaper, then wrapping it up tightly and letting it dry for a couple of weeks. 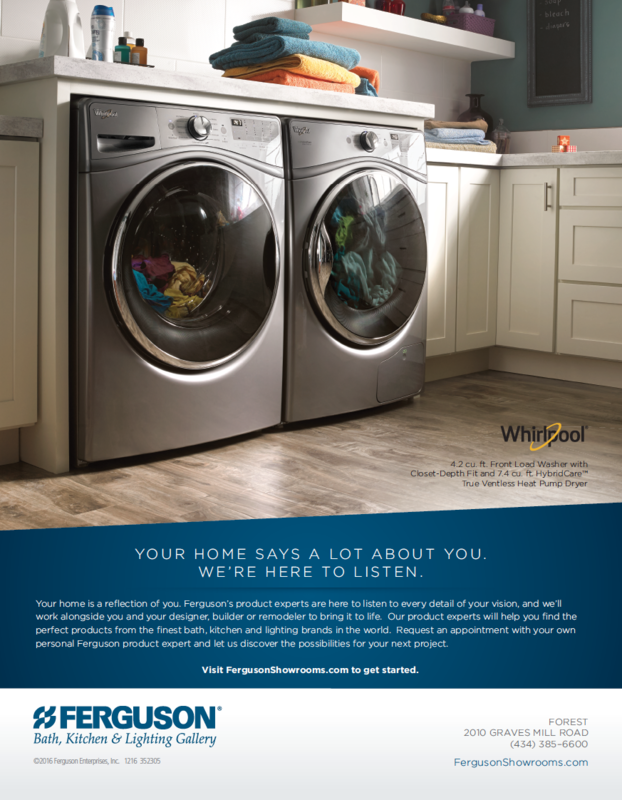 If you decide to use gas logs, there are products on the market today that mimic the performance of a wood fire. You can purchase crackle granules (made of rock, wool or vermiculite) from a fireplace supply store that will pop and glow when heated by the gas flames for an authentic wood-burning sound. They also sell realistic-looking receptacles, in the shapes of pinecones or strips of wood, to hold the granules. 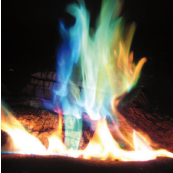 Another product that is quickly becoming the “crown jewel” (or “jewels,” rather) of gas fireplaces are fire crystals. These gems, made of tempered glass that is handcrafted or specially tumbled, come in a range of colors. Though mostly used for decoration, they trap heat without melting and are a great way to customize your fireplace, even in the off-season. Usually sold by the pound, most come with special burners that connect to the gas valve. Experiment with stacking different colors of glass fire crystals for an even more spectacular show. To keep the mantel from sustaining smoke damage, Ferguson recommends a gas fireplace over wood. While a fireplace hood can protect the mantel to some degree, “many people don’t use it because it can be an eyesore, taking away from the beautiful design,” he said. In his own home, he uses a cast-iron damper to let harmful smoke out and protect the wood from any damage it might cause. Choosing a master craftsman like Ferguson to design your mantel allows a degree of customization, making yours unlike any other. Being able to choose your own size, shape and color can be a huge advantage. You can turn your mantel into something truly unique for your home. Because the fireplace is the focal point of the room, many people choose the mantel to show off their prize possessions, whether they be family photos, souvenirs from their travels, or seasonal flair. Decorators’ blogs abound with ideas for this prime space. Traditional? Go with photographs intermixed with votive candles and woven with artificial vines. Modern? Try a single vase on one end with colorful blooms that accent your room, or a set of tall candlesticks. A large piece of art or large mirror, even if they are just propped up against the wall instead of hung, can really accent this space. 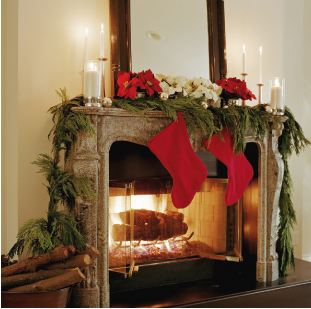 Fireplaces can attract an audience in the off-season, too, if you decorate tastefully. Do a thorough cleaning of the firebox first, then consider putting large plants inside. Ferns work well. If your fireplace doesn’t get any light in a room, look for artificial plants that can do the job. Dried hydrangeas simply laid in the grate or artificial boxwoods placed in pots are nice touches. Some people prefer a natural look when closing up shop for the spring, like a basket with kindling and pine cones, or artfully stacked pieces of wood. And others decide to make the fireplace disappear in the off-season by placing a bench, chest or small table in front of it, decorated with a couple of mementos. The care you invest in your fireplace will show year-round. Go ahead and schedule auditions (try out some different décor or burn an alternative log) and make the casting call! The show is about to begin. ■ Fireplace bouquet: Collect dried twigs from herbs (remove leaves and break to about a foot long) then lay some cotton, spread out, on top. Sprinkle a couple drops of your favorite fragrant oil on the cotton, then top with another set of herbal sticks and tie twine around it. ■ Wax pinecone fire starters: Melt crayons or old candles in a double boiler on the stove (or boil water in a large saucepan and insert a Pyrex bowl in the middle with the wax). Dip pine cones in the wax and drip dry. These make great gifts, by the way! ■ Fire starter ropes: Braid rope or twine, 1 to 2 feet long, with knots at the top and bottom. Adorn with dried fruit (apple and orange slices work well) and cinnamon sticks. Dab similar-smelling fragrance oil on the fruit and hang by the fireplace. ■ Tree trimmings bouquet: Use dried evergreen branches, sprinkled with fragrant oils, as a fire starter, or place nearby on the hearth. Many places that sell Christmas trees will offer their trimmings for free. 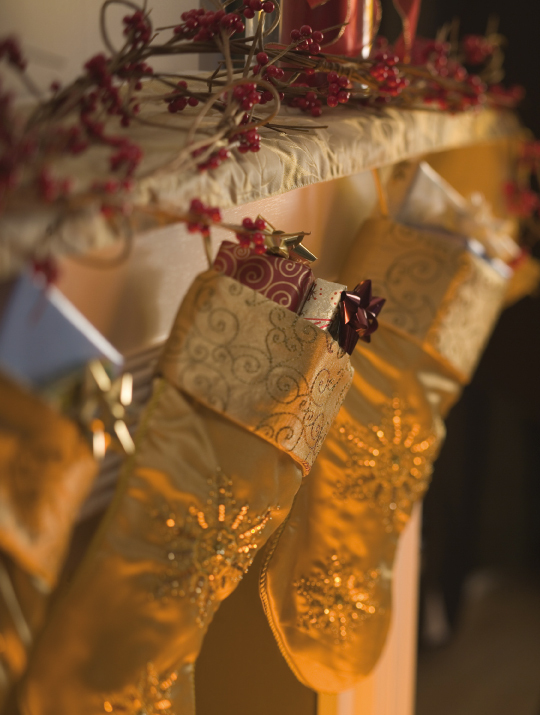 ■ Wondering now how to hang those stockings “by the chimney with care?” Woodworkers will tell you it’s never a good idea to use nails, because you risk splitting the wood, which requires tedious restoration work. Removable adhesives like 3M Command strips are a better option.